So, when I finished my exams last Wednesday, I celebrated with a bit of food and fun at Meidi BBQ house, which I’d been itching to try ever since I first set eyes on this sign advertising a self rotating BBQ. We’d walked past this sign a couple of Saturdays ago, after yum cha at Prince Restaurant, and noticed that this new restaurant had opened and although it wasn’t open (it only opens at night), we could see the individual rotating BBQs inside. There was also a list on the front, advertising all the food it had on offer which seemed like a pretty big selection of both cooked and uncooked food, and even better, for the price of $26.80 (for groups of 4 or more)! After checking the sign again to make sure that it was $26.80, we walk into a pretty busy restaurant, considering that it’s a Wednesday night. The seats are weirdly low, making it terribly diffcult to get up (or maybe it’s just because I’m heavy….haha) and we’ve barely had time to sit down before a tub of hot coal is quickly wheeled out and inserted into the barbecue. With a click of a switch, the chain in the barbecue begins to run- our cue to start barbecuing. After all, there is a two hour time limit. However, we quickly find that one barbecue, which has space for 13 skewers, isn’t quite enough for four people (at least, in two hours)- it’s better for perhaps two or three people. The food is very nothern chinese style, which consists of a lot of chillies and strong flavours. My inability to eat spicy foods means I’m not a huge fan of northern chinese food. Fortunately, the food isn’t too hot- even I could eat almost everything. Whilst the food is happily cooking itself on the barbecue, we try the selection of cooked food. The selection is quite big, and tasty, which is a good thing because we’d never fill ourselves up at the rate that the food was cooking on the barbecue. The chicken stir fry wasn’t anything special, and was a little too salty for our liking. 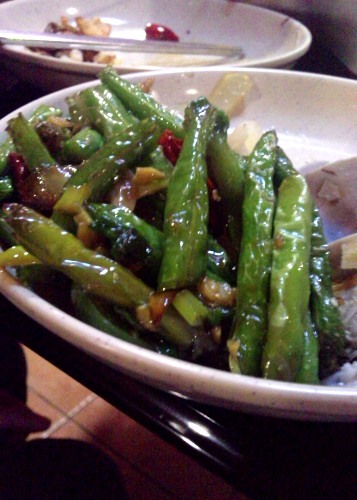 The broad bean stir fry was one of our favourite hot dishes, perhaps because the flavours weren’t too strong, the fact that we like broad beans and that there were barely any greens in the selection of food. 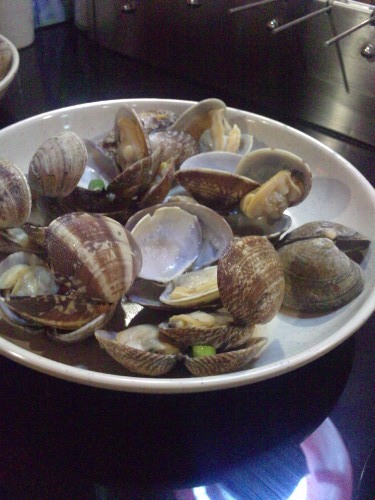 Perhaps the dryness and the flavourless-ness of the clams could have been saved if there was some sort of dipping sauce such as soy sauce, as they have in Korean barbecues. But there were no sauces whatsoever, which was one of the things that we didn’t like about the restaurant. Although the flavours in most of the food were really strong, without any sauce, the barbecued food, in particular, seemed dry. Another thing which could have really used a sauce were these dumplings, which we found tasted best after being reheated on the barbecue- making them so hot that they literally burnt your tongue. And they were delicious too, even if half of them had burnt bottoms. We decided to barbecue the chicken wings on the metal bars instead of on the skewers because the chicken wings were so wide, they wouldn’t turn if there were skewers next to them and so ended up taking up 3 skewer spaces! The chicken wings were quite ordinary, but still delicious. 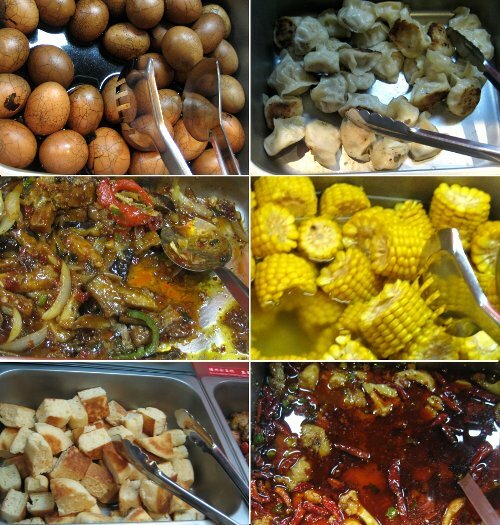 Northern chinese food wouldn’t be quite complete without a selection of cold foods to balance with the hot food. The simple radish salad, of thin strips of radish and an occasional carrot strip or two, complimented the strong flavours of the strong flavours of the barbecued food quite well. The light, tangy dressing with the simple flavours of radish brought relief not only from the spiciness of some of the food, but also from the saltiness of the barbecued food. But cold food doesn’t lack in flavour either the cold beef is quite flavoursome and slightly spicy too. 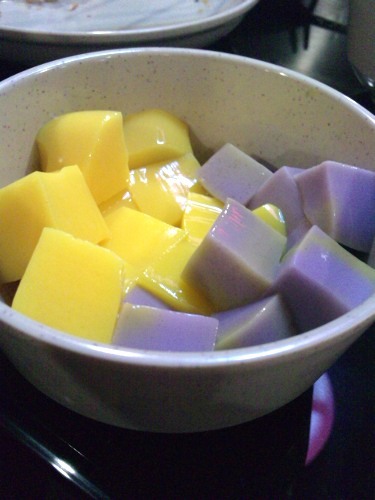 The savoury jelly (I don’t know what it’s called in english) is is also a deliciously flavoursome cold dish. 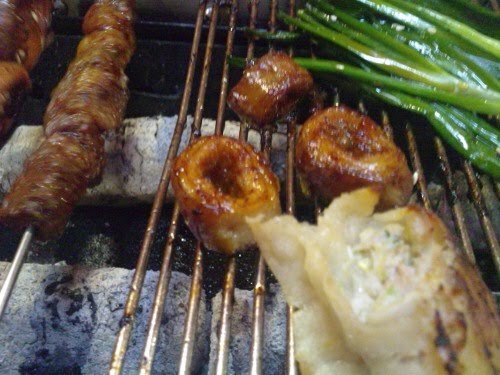 It isn’t too salty, which is a relief and being cold, it is again quite a nice accompaniment to the hot, barbecued food. It is quite delicious and we find ourselves eating quite a lot of it, but the jelliness of it, which indicates the amount of fat in there tells us that perhaps, we shouldn’t be eating as much as we do….. The cold chicken does not manage to please us, mostly because the chicken is not quite tender anough for our liking. Now…back to the barbecue itself- the most fun part of the night. There was good selection of foods to barbecue, from wagyu beef (which to me, didn’t taste any different to normal beef….so I’m guessing it isn’t the good quality stuff) to mongolian lamb to chicken wings and prawns. Oh, and there were chicken hearts and intestines too 😉 The meat was cut up into small cubes and skewered so that they would cook quickly. I love trying weird animal parts, so it was not much of a surprise that I went for the pig intestines and the chicken heart =] Which was recieved with groans by my mum who feared that they would make me sick- so we barbecued them for ages…..
To balance the very salty mains, there was dessert! 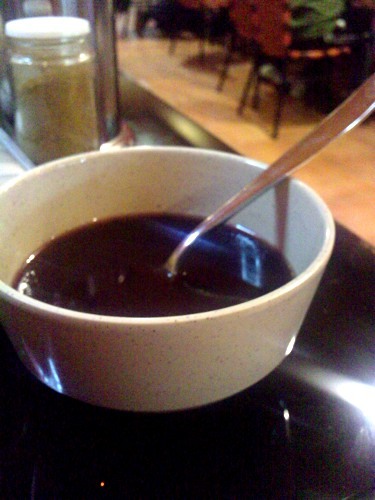 The red bean soup was a little watery, like most red bean soups at restaurants (I like mine thick) and has blobs of both red bean and black rice which gave it a funny texture. Served hot, it wasn’t too bad but it wasn’t exactly my favourite…. 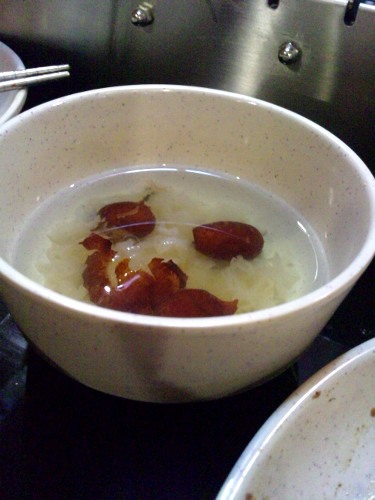 A simple sweet soup with ‘snow ear’ fungus and red dates, it tasted surprisingly refreshing and was actually a great ‘drink’ accompanying the salty and spicy food. Yeah- I didn’t actually eat it as a dessert but drank it instead! But then again, we did eat a lot of the cooked food because the food took a while to barbecue so I guess it’s understandable…..
Tucked up in the corner, away from all the other food was a mysterious little freezer which had the words ‘ice cream’ roughly scribbled on a paper stuck to it. Curious to see, we opened the freezer, which, was no easy feat (the lid was stuck strongly on!) to find a tub of vanilla ice cream along with about 4 unopened ones underneath it (which is how we found out that it was homebrand ice cream..haha) A nice way to end the meal, we ate a couple of scoops of ice cream. But plain vanilla ice cream can be boring, so to jazz it up, I came up with an idea to pour the red bean dessert over to make red bean ice cream! haha…..
We had some red bean dessert left over, which hadn’t quite completely cooled down yet, but seeing as it was time to go we poured it over anyway to create a delicious red bean ice cream dessert =] Overall, I thought it was a really fun experience, even if the food wasn’t all that great. I’m not sure if I’d go again, but I think it was worth it, just for the experience! don’t remember the price for other days….. Sometimes I do enjoy 'buffet style' dinner too, but it makes me very greedy normally, because there's too much food around ;)! It's too bad there is a time limit! 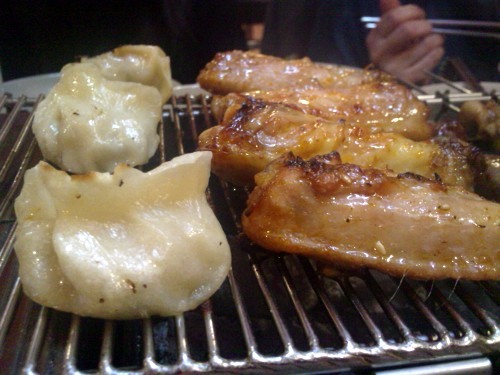 BBQ-ing foods yourself at a restaurant sounds like fun! Wow, there were alot of choices. I'd have had a hard time..except for the weird animal parts..those I could leave alone! 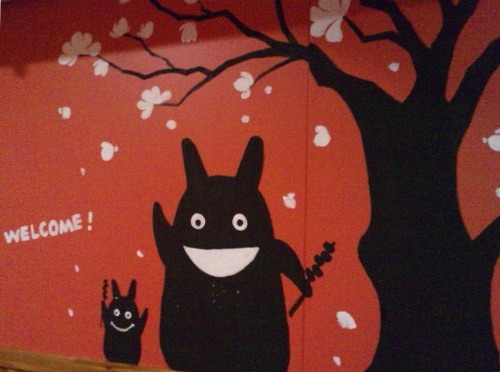 Was just drooling over Chocolatesuze's post on this and here is Meidi again! Sounds a great value buffet and the purple and yellow jellies look mesmerising! I was scheduled to try this place out on Saturday but changed my plans. I love anything on a skewer. Oh I have to go soon. All that BBQ is making me hungry. Woah! That's a lot of food there.. big variety! This place sounds like a lot of fun! And what a great variety of food they have! I wish I could try all of those. They look so good. Unfortunately we don't have much of choice with Chinese here. But I am heading to Canada for weekend so hopefully I will come across something similar. oh this sounds really fun! Great for occasion when we want to hang out with a large group of friends! great eats and so glad you are having some down time!! 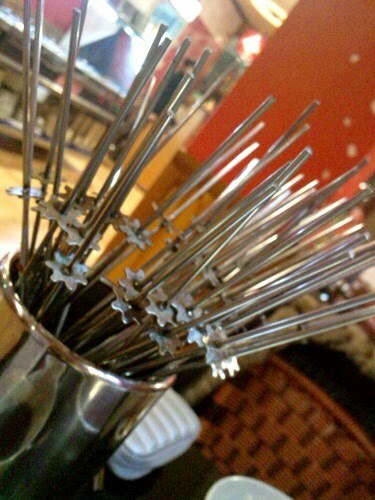 Hi Von.. 13 skewers each is not a bad effort .. especially considering all the other types of food you guys consummed !! Wow, so enjoy! OK Von, I have an awrad for you. Please feel free to stop by to collect the button. Thanks & have a wonderful day. Aw, lots of yummy dishes. It's good to have a good meal to celebrate after exams.